This is Part 6 of my story. 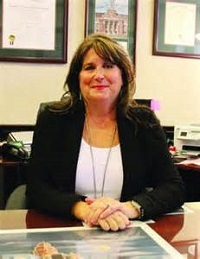 Ellis County Judge Cindy Ermatinger is shown here. She set me free after 53 days. Judge Cindy Ermatinger is my favorite judge in Ellis County Texas. If you haven't read Part 1, Part 2, Part 3, Part 4, or Part 5, please do, as this makes the most sense when read in chronological order. 58. On Monday morning, December 8, 2014, the Relator filed a detailed Motion to Recuse Judge Bob Carroll. Extensive wrongdoing has been itemized. This apparently delayed the 1:30 pm hearing on attorney’s fees and sanctions with Sean D. Fleming [that Judge Bob Carroll had scheduled]. 59. On December 9, 2014, the Relator attempted to appear before Judge Cindy Ermatinger [to present his Petition for Writ of Habeas Corpus so he could go home]. He was informed that she would be out of town all week. 60. On December 10, 2014, the Relator then attempted to meet with the Magistrate who had arraigned him as per the Texas Code of Criminal Procedure Article 51. The [Ellis County] Sheriff’s Department/Jail denied his request and said the Magistrate had no authority. This is, of course, false. 61. On December 11, 2014 at 5:30 am, the Relator sent an Inmate Request Form to Booking at the Ellis County Jail to say that he wishes to post bond. 62. On December 11, 2014, the Relator was exposed to Tuberculosis. The Relator had been exposed to Herpes a few days before. 63. On December 11, 2014 at 3:45 pm, the Relator asked the P Tank guard why he had not been contacted to post his bond. The guard said he would check. I will add more detail and exhibits to Part 6, but I want to get the basic story out there first. Then I'll go back and supplement. I have diary information to add as well.